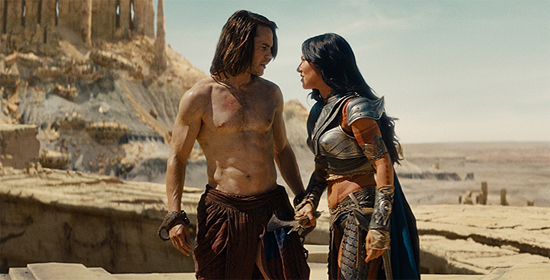 A New International Trailer for 'JOHN CARTER' Reveals his Origin! A new International trailer has been released for director Andrew Stanton’s [Wall-E] John Carter. Based on Edgar Rice Burroughs’ novel John Carter of Mars, the movie tells the story of a former Confederate soldier who is inexplicably transported to Mars where he finds himself in the middle of an epic war between the planet’s inhabitants. Constantly searching for a way home, Carter finds himself caught up in a war between dueling martians. The movie stars Taylor Kitsch, Lynn Collins, Samantha Morton, Mark Strong, Ciaran Hinds, Dominic West, James Purefoy, Daryl Sabara, Polly Walker, Bryan Cranston, Thomas Hayden Church & Willem Dafoe. Hit the jump to check it out. I'm reading: A New International Trailer for 'JOHN CARTER' Reveals his Origin!Tweet this!